Approximately 400 fast food workers in New York City went on a day-long strike Thursday — the latest action in an ongoing campaign for higher wages and a cross-franchise union. So Tina Smalls joined approximately 400 other fast food workers across New York City in Thursday’s day-long strike — the latest action in the ongoing campaign that is demanding a raise of $15 an hour and attempting to form a cross-franchise union. Twice as many workers participated in Thursday’s walkout than in the previous strike, which launched the union campaign in November. The ongoing effort has highlighted the highly exploitative conditions faced by those at the deep fryers and cash registers of America’s most profitable fast food outlets, which include Burger King, McDonald’s, Dominos, Pizza Hut and KFC. The actions and considerable media attention has also begun to chip away at the conventional image of a fast-food worker as someone who bears her servitude with a youthful grin. While it’s true that some workers arrive fresh from high school, the average age of these employees is 28. Many are middle-aged or even elderly. The majority are immigrants. And all face the reality of working, often for years, at a salary that is at or just above the legally allowed minimum of $7.25. Plans for the cross-franchise union campaign were first initiated about a year ago by the advocacy group New York Communities for Change. The Service Employees International Union has provided financial sponsorship and legal aid, while faith groups have lent moral encouragement. The first walkout occurred on November 29, which was then the largest protest action of fast-food workers in the industry’s history. Throughout the winter, organizers super-sized their efforts. New York Communities for Change hired a slew of new organizers, including veterans of the Occupy Movement, to reach out to additional fast-food employees. The group began a petition, which garnered 110,000 signatures even before the second action. Yet, the decision over whether or not to take part in Thursday’s action, which was timed to commemorate the assassination of Martin Luther King Jr., has rested on the shoulders of the workers themselves. As a result, the cornerstone of the organizing strategy has been debates and secret meetings, which have been taking place inside the city’s fast food joints for months. Citywide meetings between workers from various franchises have bolstered the shop-by-shop gatherings. As managers began to sense that something was occurring, they interrogated workers individually, which is illegal, and fired those whom they identified as strike leaders, which is also illegal. Managers have also held mandatory meetings aimed at convincing their employees not to join the campaign. One organizer with New York Communities for Change, who asked to remain anonymous since he was not authorized to speak to the press, explained how the intimidation works. “The boss calls in everybody that works for him and takes about an hour to talk about how bad the union is and how they’re going to take your money,” she said. Two economic revolutions of the 1970s — automation and globalization — have also contributed to the downward spiral of wages over the last few decades. Automation has meant that fewer hands are needed for industrialized labor, while advances in transportation technology exported jobs overseas. Both pushed more and more people into the service industry. Meanwhile, radical organizers were systematically rooted out of unions during the Cold War under the guise of fighting the internal threat of communism. Left in charge were those who preferred to operate unions with a top-down business-friendly model, a shift in the labor movement that also hampered the expansion of worker power. Today, as the economic recession continues, employers have a surplus of low-wage labor and only flashes of organizing to oppose the resulting exploitation — a dynamic that is leading to a surge in corporate profits even as wages decline. This disparity is particularly pronounced in the fast-food industry. In the most extreme example, net profits for McDonald’s totaled $5.5 billion last year, while the company’s rank-and-file report being forced to picket for a raise above minimum wage. As the U.S. gradually becomes a low-wage nation, fast-food workers on the picket lines in New York are in the vanguard of a struggle to preserve the interests of working people against corporate profits. Yet, despite this obvious inequality, the campaign to organize these workers has a long journey ahead. 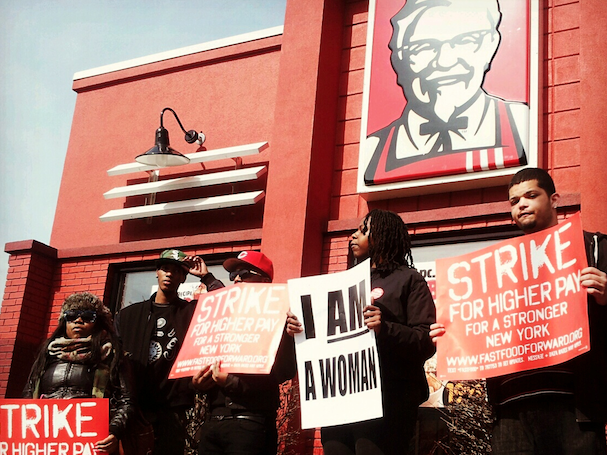 Although hundreds joined Thursday’s strike, there are tens of thousands of fast-food workers in the city. One challenge has been working in an industry with no history of unionization. 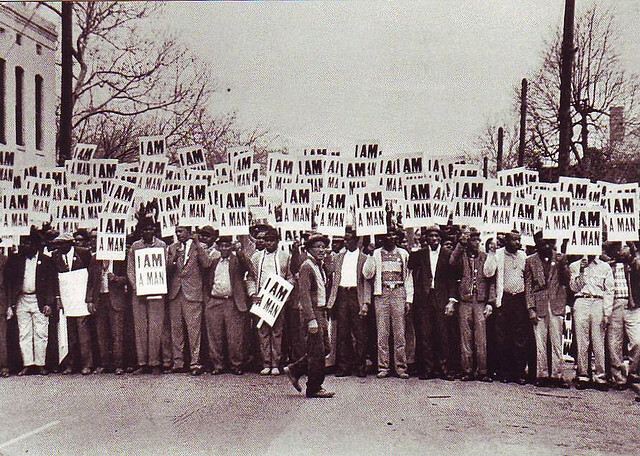 A week before Thursday’s strike, organizers and fast-food workers listened to Baxter Leach, who marched with Dr. Reverend Martin Luther King in Memphis, Tennessee, during the successful 1968 sanitation workers strike. Leach said that the challenges workers he met in New York described to him brought back memories of what he and his comrades endured before they won union recognition. As with the job of sanitation workers, the task of serving junk food isn’t considered a prestigious position in our society. But those on the picket-lines Thursday in New York hope that the courage and dignity with which they’ve imbued their struggle will inspire more of their fellow workers to join them and push Reverend King’s dream of equality closer to reality. Peter Rugh is a writer and activist based in Brooklyn, New York.